Pre-Script: Work swallowed me whole for seven days. I have now been spewed forth. Let's get back to the business of chasing rabbits. I don't cook. Most meals at my home are eaten at my bathroom sink (while plastering my AM face) or while watching Tivo after a super long day. Umm...I may need a life. 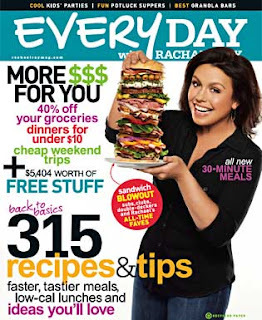 But Everyday with Rachael Ray always boosts my food esteem. At least for the day it came in the mail. I will confess I have ingested as much teen entertainment AFTER crossing over to adulthood as before. And Zac Efron is one reason. 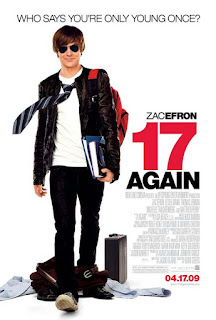 However, I knew 17 Again would be a waste of his hair. But no... It was much better than I expected. And not just because I may or may not be a puma. The scene in the cafeteria is well worth the $1 at Redbox. Old news: I love MuteMath. Their new album, Armistice, is a lovely mix of great Paul Meany vocals and a snazzy synthesizer. Yes, it can be snazzy. Alternative Press crowned them the "#1 band to see live before you die." Alternative Press should be renamed Youaredangstraight Press.